Rarely does an outdoor block party give an attendee the opportunity to sit down with a cold beer as a pharmacist-in-training presses two fingers to her wrist, feeling for a pulse. 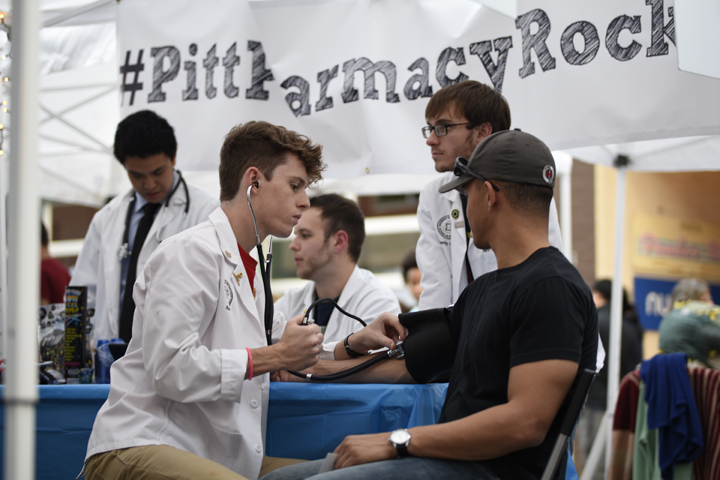 But on Saturday, Pitt’s chapter of the American Pharmacists Association-Academy of Student Pharmacists, or APhA-ASP, defied the conventional street fair norms. APhA-ASP — a group that represents Pitt pharmacy students — participated in Squirrel Hill’s annual Rock the Block event to collect money for the American Diabetes Association. The afternoon of music and art, co-hosted by Squirrel Hill community groups and Pitt’s School of Dental Medicine and School of Nursing, began at 5 p.m. on Murray Avenue in the Squirrel Hill business district. Musicians, including Eastend Mile, Emerson Jay and Nevada Color, played until 10 p.m., backdropping a wellness fair and a Zumba demonstration. Local market vendors, food trucks and artists catered and also participated in the event along with 40 businesses and restaurants. “[Getting your blood pressure taken] in settings like this makes it way more approachable and not as scary as going to a doctor,” said Sarah Greener, a senior in the nursing school and president of Pitt’s Nursing Student Association who was assisting in blood pressure monitoring services. Nevada Color’s lead singer stepped off the stage during his performance to shake hands with the crowd, while festival-goers listened to music, munched on pad Thai and admired their new wine bottle wraps made from recycled denim. Around the stage, pharmacy students set up booths to provide personalized health screenings and educate attendees about exercise, healthy eating and vaccinations. Kristel Chatellier, a second-year pharmacy student, offered fitness advice and a Tide laundry detergent bottle to demonstrate a college-friendly form of weight lifting. Students shared wellness tips between alternating runs to food trucks for cannoli bites and the stage for classic rock tunes. The event promoted healthier living by providing free flu shots and BMI tests and beer with grilled cheese sandwiches — minus the unhealthy toppings. Katie Castello, a Pitt alum, said she was impressed with the fair and would have benefitted from a similar event during her time at Pitt. Visiting families, students and Squirrel Hill locals toured local artisan businesses sponsored by I Made It! Market, which is Pittsburgh’s nomadic crafts marketplace that promotes natural and resourceful living. Mixed aromas circulated throughout Squirrel Hill’s bustling streets, coming from the Cool Beans food truck, Mineo’s Pizza House’s fresh pizza, Bangkok Balcony’s papaya salads and Coop Chicken and Waffles. As the night progressed, the local Pittsburgh musicians each hit the stage across from the beer garden, enthralling members of the multigenerational audience with indie, pop, jazz and hip-hop music to contribute to raising diabetes awareness. Attendees strolled through the street with bags of glucose-monitoring equipment, personalized nutrition plans and sugar-free M&M’s as third-year pharmacy student and president of APhA-ASP, Archita Achanta, reiterated the fair’s slogan. “We can battle this together,” she said.